Shobaleader One: available for Formula 1 race starts all over the world. 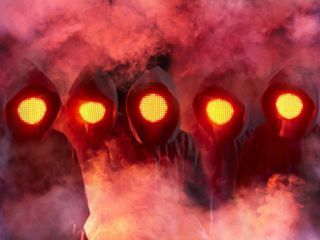 Squarepusher has revealed a little more a about his forthcoming new album, d'Demonstrator, notably that Shobaleader One, which we thought was part of the title, is actually the name of the band that was formed for the record. In a Q&A on the Warp website, Squarepusher (AKA Tom Jenkinson) says: "Shobaleader One is my band. Last summer a bunch of kids got in contact with me. They were talking about forming an ensemble, which I thought was a ridiculous idea but I was impressed by their perseverance so we met up. "Their idea was that they wanted the 'fantasy group' I had written about in connection with [last album] Just A Souvenir to become a real entity that would record and tour. So we had a go at doing some recording and the story so far is documented on this record." That's that sorted out then, but when it comes to putting names to band personnel, Jenkinson isn't so forthcoming: "[It's] basically a bunch of people who you may or may not have heard of from other bands and projects. Part of their idea is that this music is a completely clean break with whatever they've done in the past so I'm not allowed to mention any names. I can tell you that they are pretty frightening players." He does go on to say that the musicians "come from a metal background but they're all bang into really slick R&B," adding that there are plans to tour next year and possibly record more music together too. A Squarepusher collaboration with Andre 3000 from Outkast is also a possibility, apparently.